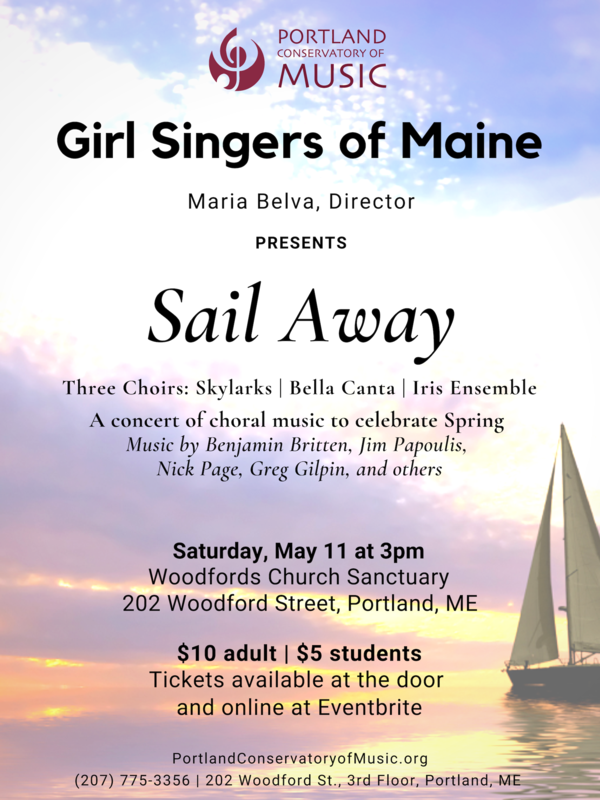 The Portland Conservatory of Music’s Girl Singers of Maine is a group of choirs for young women in grades 2-12, directed by Maria Belva. The Skylarks (grades 2-4), Bella Canta (grades 5-8), and Iris Ensemble (grades 9-12) rehearse Tuesday nights at PCM. Note: Tickets are available online up until May 10th at 4pm. After then, tickets will be available for purchase at the door. Please contact us at info@portlandconservatoryofmusic.org with any questions. Please join us for our 2019 Spring Serenade! 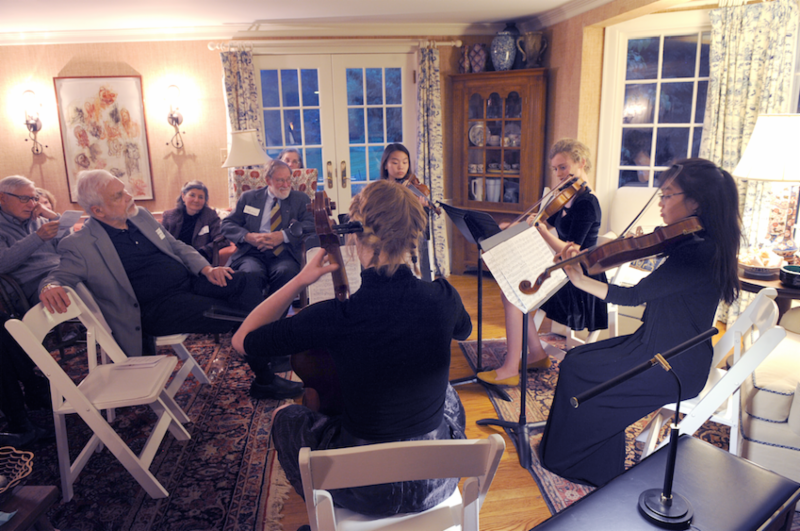 The Spring Serenade is an evening of music and celebration to support PCM’s mission of making high quality music accessible to all. The evening features performances by the Karger College Prep Program, Jazz Studies Ensemble, Playa String Quartet, and others, and includes a mission-based auction, food, drinks, and merriment. Tickets are $75 for one, or $125 for two, and the event is held at a private residence in the area. Please contact the PCM office at (207) 775-3356 or info@portlandconservatoryofmusic.org if you would like more information! Once a ticket is purchased, you will receive the event address in a confirmation email. Please RSVP by May 13th. Tickets are on sale online until May 13th at 11:30pm, after this passes please contact PCM directly at info@portlandconservatoryofmusic.org. We would love for you to join us to hear what our students have been working on this Spring! 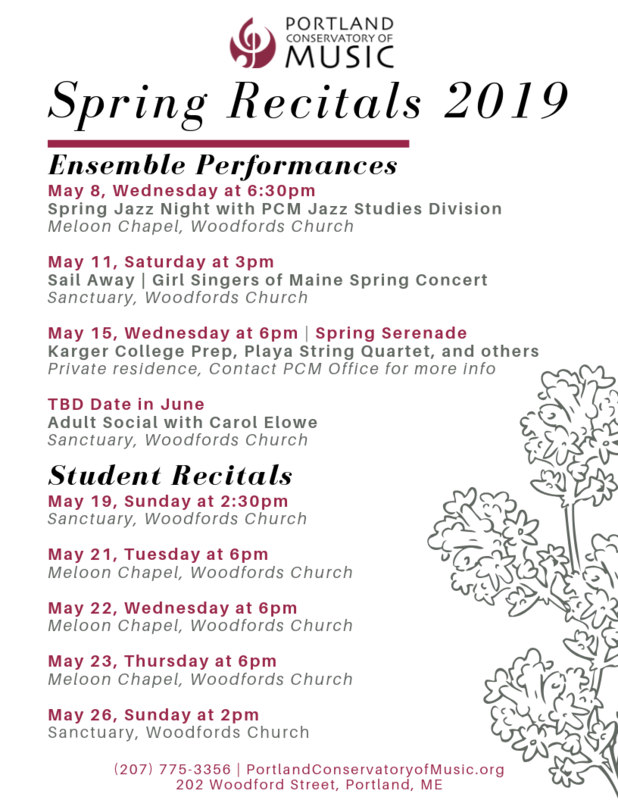 All recitals are free and open to the public with the exception of Sail Away on May 11th and our Spring Serenade on May 15th. Students and Families: Please make sure to submit your recital form if you would like to participate! Available for download here.